Set your '08-Current Chevrolet Cruze apart from the rest with this classic yet "sporty" Body Side Graphic kit. 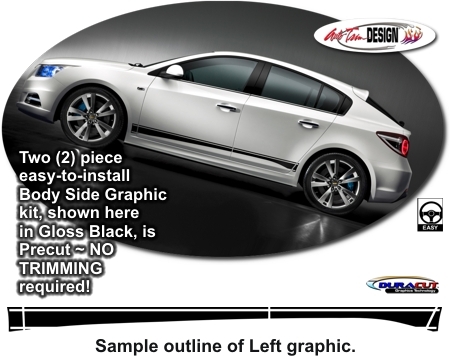 Distinct from generic body side graphics, this kit is specifically created and manufactured for the Cruze's unique lower body contours (Sedan or Hatchback) and is designed to be applied along the indentation as shown. Kit is PRECUT ~ NO TRIMMING required! Note: Kit will fit the Holden version of this vehicle.